After intensive research the restoration team of the Royal Institute for Cultural Heritage (KIK-IRPA, Brussels) has removed the old overpaint that masked the main figure of the Ghent Altarpiece for nearly five centuries. 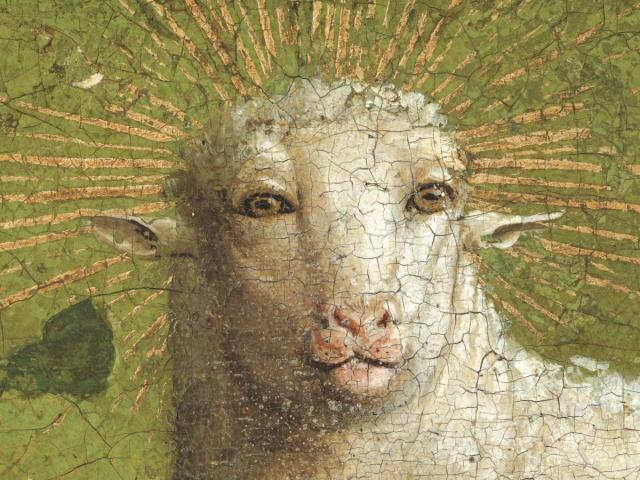 As such, the well-known Lamb – an impassive and rather neutral figure, with a wide forehead and large earls – has given way to the Van Eycks’ original. With its intense gaze the Van Eycks’ medieval Lamb, characterized by a graphically defined snout and large, frontal eyes, draws the onlooker into the ultimate sacrifice scene. 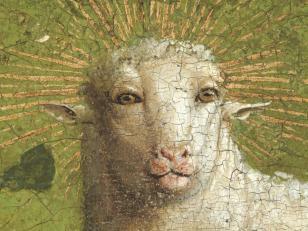 The Lamb was overpainted in the middle of the sixteenth century. This was part of a larger intervention carried out to cover up some small damages and early, clumsy restorations and to refurbish the master piece. During a restoration in 1951, the removal of green overpaint around the head exposed the original, smaller ears, and since then the Lamb appeared to have four ears. The multidisciplinary research of the KIK-IRPA, carried out in collaboration with scientists of the universities of Ghent and of Antwerp, revealed that around 45% of the paint surface of the central panel with the Adoration of the Mystic Lamb was overpainted in the sixteenth century. Apart from the Lamb, this mostly concerns the sky, buildings and hills in the background, the draperies and the altar cloth. Only 3% of the underlying, original paint layer by the Van Eycks has been lost, so all overpaint can be removed. While removing the overpaint – a delicate operation carried out under the microscope with surgical scalpels – the restorers discovered a subtly shaded sky with streaks of clouds above graceful mountains. The original buildings, overpainted with greyish layers were painted in a variety of colours, with a beautiful play of light. Even new buildings are emerging from beneath the much simpler repaint at the horizon. The solid-coloured costumes make place for luminous draperies with complex folds defined by delicate lines of highlights and deep-toned shadows.